It was an ad where a beautiful girl's picture was shown. I first thought that it should be a cosmetic ad. But then I saw the word "Gift your sister". This made me wild. How can the advertising brand call her my sister? That totally put me off. This is the same thought that would have hit all the men who saw this ad. 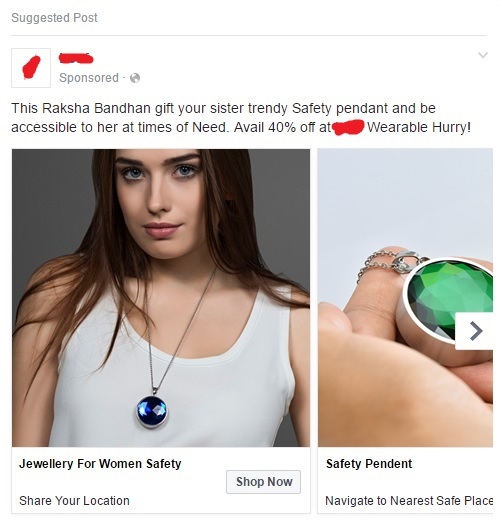 The second thing that caught my attention was that this pendant that was advertised in the ad was labelled as "Jewellery for women safety". It doe not have a pepper spray, nor does it have a laser gun attached to it. In that case, how on earth would it give women an assurance of safety. It seems there is a chip that alerts people on their phone when attacked. The chip that costs Rs 200 to make is now being marketed for Rs 4000/- just because it finds itself in a jewellery. To make matters worse, the pendant is long and is strategically placed between the girl's breasts. Is that a safety mechanism? I don't know. May be safety experts might know it best. I came to know that the pendant almost weighs 200 grams. With such a heavy pendant, those girls who wear the chain will develop spondylitis. Read my post exclusively written for guys on how to run away from girls on Raksha Bhandan [Link].